In the previous section, whether you knew it or not, you were already "gathering data" that could contribute to a better understanding of human vision. One of the primary methods that you used was introspection. Introspection is simply paying careful attention to the subjective character of your own experiences. So, for example, you were asked to stare at this figure. While introspection is one of the methods that scientists sometimes employ in the study of cognition and perception (especially concerning the nature of consciousness), it has its limitations. First, there is considerable controversy about the value of this method. There are some who insist that how our experiences seem "from the inside" is so misleading that it is best not to pay too much attention to it. Second, and more importantly, everyone admits that it is not a method that one can use on other people. If I am a scientist, I cannot design an experiment in which I am able to share your visual experiences of the figure above. What I can do, though, is to ask you questions about what you see and then I can observe your behavior. I can observe your linguistic behavior (i.e., what you say about what you see). I can observe the behavior of your eyes. With special cameras that follow the movements of your eyes, I can track every blink and flutter. I can also hook electrodes to your brain and, with the proper equipment, observe which portions of your brain show increased electrical activity while you're viewing the figure. In each of the cases where I am able to observe some aspect of your behavior or the activity of your brain, I can employ the experimental method to gather data that might shed light on the nature of human vision. One common strategy would be to gather a group of subjects and to systematically control what they look at (e.g. show each of them series of ambiguous pictures, like the ones above). One might then observe some particular aspect of their behavior to see how their behavior varies in response to each of the images. You could then organize the data so as to reflect the various responses given by each of the participants. Finally, one must decide how to interpret the data that's been gathered. Does it mean anything? Does it allow us to draw any interesting generalizations about how humans perceive certain types of images? Does it give us any support for the truth of some specific theory of vision? In subsequent sections, there will be a good deal more discussion of the experimental method. In fact, you will have the opportunity to be a subject in a real-life, honest-to-goodness vision experiment. Before moving on, however, there is one more informal experiment that you can do on yourself. What is the brain up to? As you look at the various images you will be shown below, try to pay attention to the details of your visual experiences. Go through the images slowly, one at a time, asking yourself the question: "What do I see?" If there are any dramatic "shifts" in what you see, pay attention to the details of those experiences. People respond differently to these images. One common response is to "see" the figures as simple, abstract two-dimensional shapes until the horizon line is added. (Actually, what looks like the horizon is actually 4 different lines -- 3 short and one long.) At that point when the horizon is added, many people experience a three-dimensional scene with road, horizon and sky literally "popping-out" of the screen, all at once. These dramatic shifts of perspective are often called Gestalt switches. Other people experience it differently. For some it only takes the addition of the large triangle to force a shift to the 3D perspective. 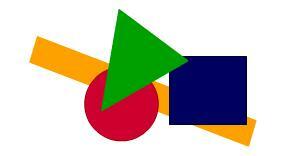 Other don't "see" the triangle as a road and the horizontal line as the horizon until the last colored frame. For them, the triangle and line look more like a two-dimensional balance with the triangle as the fulcrum. What we are interested in here, is not so much when the shift occurred but rather the how and the why of it. For those who see the dramatic shift with the addition of the horizontal line, consider how remarkable that is. With the addition of such a tiny bit of content, the flat, sparse plane of 2D lines and figures is dramatically transformed into a 3D world of objects (some closer, some further away), the horizon, and a road receding into the distance. How is the brain able to take a few, quite unassuming little lines and make of them a whole world? Consider, for a few moments, all of the internal processing that the brain needed to do to produce the 3D world. Certainly it is easy to get a camera to produce a two-dimensional projection of a three-dimensional world. But the camera is wholly incapable of "seeing" that projection as a world. It is the brain that possesses the astonishing ability to see those lines as a world. It is that ability that we will explore. Let's examine another set of images that give us clues about the brains activity. Before you push the button, look at the objects that are stacked upon one another. There are four identical blue objects in one stack and four identical red objects in the other. When the button is pushed, the four blue objects are going to re-arrange themselves and in the process a fifth object will be created. Similarly, the four red objects are going to move and create a fifth. As it happens, think about what process the brain might be going through to accomplish this feat. What do you see when the objects stop moving? Do you see a square and a triangle in the foreground, blocking out portions of (i.e., occluding) the objects behind? That's what most people see. But isn't that a bit odd? There is no triangle. There are are only a few chunks cut out of the rectangles. But the visual system "sees" a trangle in those missing chunks because that is the interpretation of the scene that it selects as the proper one. The brain is doing a good deal of "processing" as it constructs three-dimensional experiences of the world. Usually, we are completely unaware that all of the processing that is going on. (It takes images like the ones shown above to draw our attention to it.) Scientists who study vision attempt to discover the secrets of this unconscious processing. There are many fascinating methods that are used to investigate the complex workings of the mind. In the past few pages, you have used introspection as you attended to the character of your own experiences and you observed your behavior as you gave answers to the questions that you were asked (let's pretend that you answered the questions out loud). In the pages that follow, you will be introduced to other research methods that are a bit more sophisticated. You will not simply read about these methods as a passive observer, however. You will learn to use a number of these methods as you begin to explore the mysteries of human vision. So, roll up your sleaves and let's get to it.